Would you spend hours on a treadmill or wander aimlessly around the gym if you knew there was a more effective, more FUN way to get the body of your dreams? Here at Chute Boxe KC, we want to make your health and fitness a priority - while having a blast! Boxing, Jiu Jitsu, Fitness and a mix of martial arts offer adults in Kansas City an escape from reality. The release of endorphins associated with our Adults Martial Arts program is the ideal way to unwind and de-stress. There's something for everyone, and we make sure everyone is safe, comfortable, and learning at their own pace. WHY IS OUR ADULT MARTIAL ARTS RIGHT FOR YOU? Chute Boxe is the premier Brazilian Muay Thai academy worldwide. With over forty years of rich history and decorated champions, the techniques are not only battle tested but have been evolving and improving since 1978. Grand Master Claudio Mattos instructs the most authentic Brazilian Muay Thai training sessions available. An incredible workout while working on traditional techniques under the close eye of one of the best Grand Masters in the world. Plyometric, partner drills, flexibility training, and controlled sparring keep all sessions unique and challenging. Basic Muay Thai techniques and combinations instruction introduced on a heavy bag. With the same fitness output as many of the other Fitness Bag classes, this is a great way to get some great exercise while learning basic Muay Thai skill. 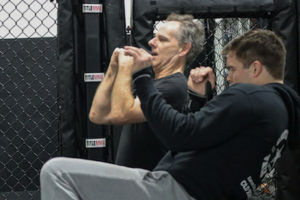 After bag work the techniques are drilled with a partner then practiced during controlled, concentrated live situations. Safe, fun, and challenging. This class is a great way to prepare for Professor Mattos more intense authentic Muay Thai classes. This class is a great opportunity for all members and fighters to practice form and get busy to a bit of funky music. 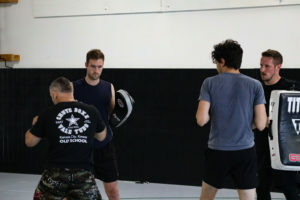 Instructed by a Kung Fu Master and kickboxing champion this class utilizes a blend of hard and soft martial arts styles. Perfect that punch, tweak that kick, and have a great time doing it! 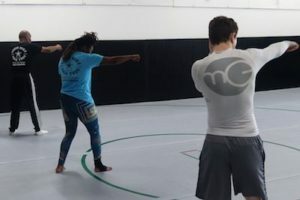 The advanced MMA class is a special opportunity for fighters to practice and receive instruction on practical fight situations while getting functional strength and cardiovascular training. Partner drills, cage work, striking training, and sparring. Both active fighters and regular members are welcome to attend and become a better mixed martial artist in this difficult class. All of the training from the past week can be worked on and polished in this sparring session. This is an open gym session and people from other gyms are more than welcome to stop in for a $5 drop in. This sparring session is a staple of our academy’s culture. 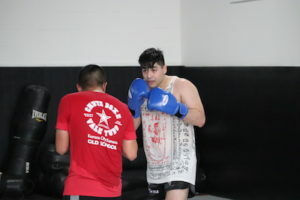 Open sparring is great for all fighters and members who would like to hone their craft in a controlled and friendly atmosphere. Unstructured class time for members to get out on the mat and drill or spar with other members. A great time to discuss techniques and learn from others! DON'T MISS OUT! GET STARTED TODAY! We offer plenty of classes to make it easy for you to make time for martial arts. Our instructors are friendly and excel at teaching student of all ages and abilities. We staff our classes with ample instructors to insure everyone will get the personalized attention they deserve. Sound hard to believe? We are confident you will be blown away! To learn more about our Adult Martial Arts classes, please fill out the short form on your screen. We will have information immediately sent to your inbox.